Small but charming island, located at the south of the Cyclades cluster, with an increasing reputation from year to year; typical Cycladic environment and an enchanting Chora, one of the most beautiful settlements in the Cyclades. 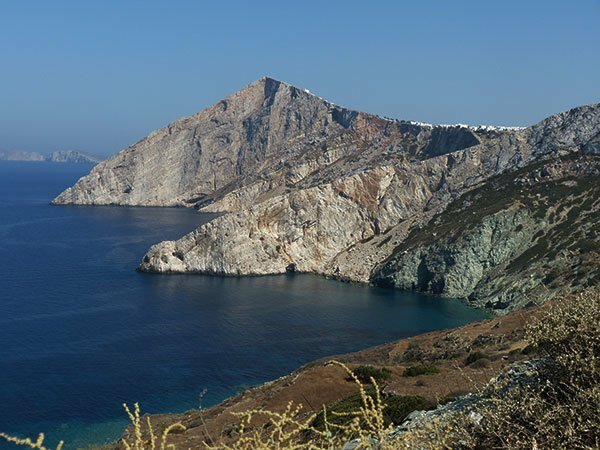 Folegandros is located southeast of Milos and southwest of Sikinos separated by a 5.5 nm sea strait. It has an area of 32 sq km, a length of 13 km and a width of 5 km. The soil is dry and the highest peak, Aghios Eleftherios, is at 414m, on the southeast part of the island. The coastline has a length of 32 km. In most part the coasts are rocky without many bays. A strip of land separates the island into two parts, north and south. In this narrow isthmus which is called Porta (door) and has a width of a little more than 1 km, the two largest bays are formed, Vathy bay in the west and the Plaka bay in the east. Of particular interest for hikers is the northern part where trails lead to characteristic landscapes with terraces, small churches and windmills. The island has 560 inhabitants and the capital Chora, with 250 inhabitants, is located near the east coast above Plaka bay. The port, Karavostasis, is on the southeast coast at 3 km from Chora. In the north is located Ano Meria, the second largest settlement of the island. 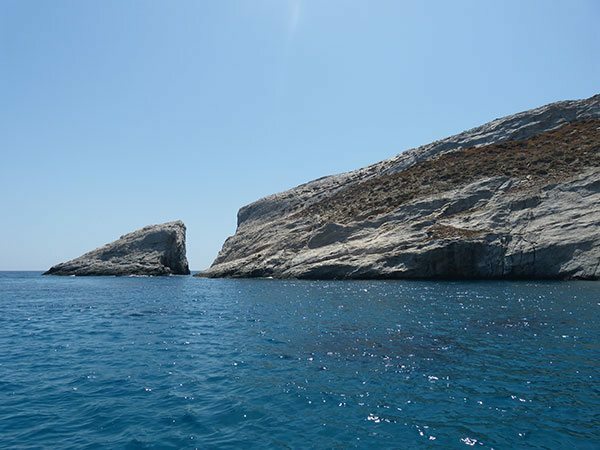 We can reach Folegandros by ferry from Piraeus (102 nm). In summer we can also take the high speed boats which connect the southern and the eastern Cyclades. 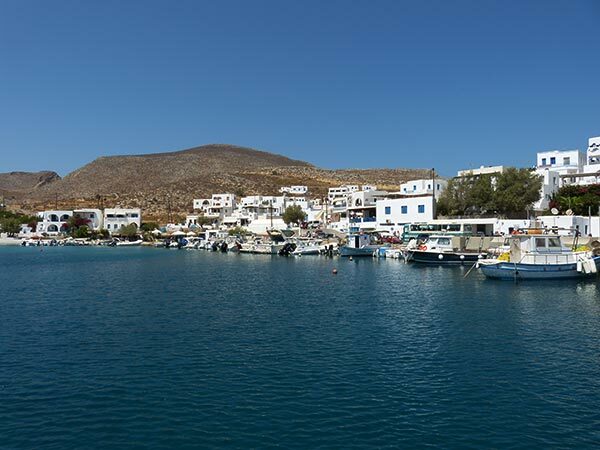 As the trip by ferry lasts several hours, many prefer to go by plane to the island of Milos or the island of Santorini and from there take the boat to Folegandros (15 nm from Milos and 22 nm from Santorini). The port Karavostasis is a safe shelter for yachts mooring, supplying and basic technical support; Agali, a small port in Vathy bay, is another safe anchorage. 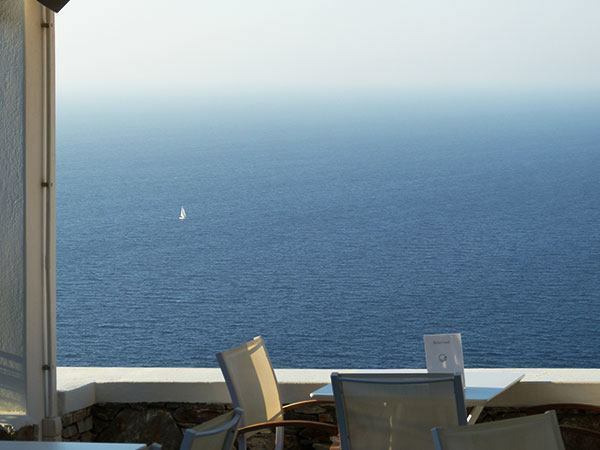 In Chora, there are hotels of all categories, adapted to the traditional setting, as well as rooms to let. Accommodation facilities can also be found in Karavostasis, Agali and Ano Meria. There is also a camping site in Livadi beach, south of Karavostasis. 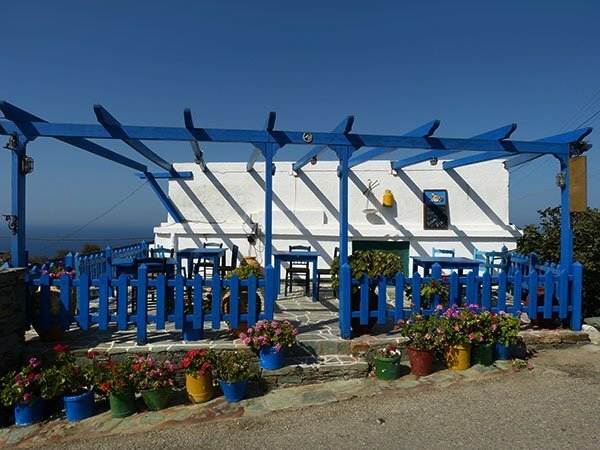 In Chora, restaurants, taverns and bars for evening recreation; taverns with fresh fish and bars in Karavostasis; seaside taverns in Agali; taverns, traditional cafes and traditional laboratory of pastel (nougat) in Ano Meria. Bus service: Karavostasis-Chora-Agali-Ano Meria. In summer we can take small boats from Karavostassis, as well from Agali to make the round of the island and visit isolated beaches and caves approached only by sea. According to mythology, the older name of the island was Polyandrous, because most first inhabitants were men, shepherds from Western Greece. Even today often sailors call it Polykandros. 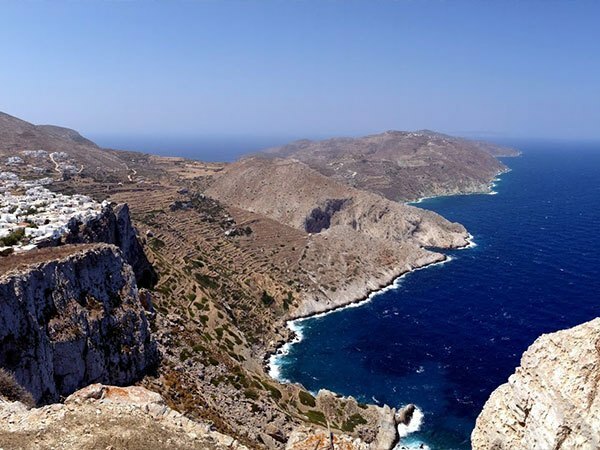 History says that the first inhabitants were Cares, as in the other Cyclades, and that the island was another trading post of the Phoenicians, who called it “rocky land”. The current name came from Folegandros, one of the sons of King Minos of Crete. 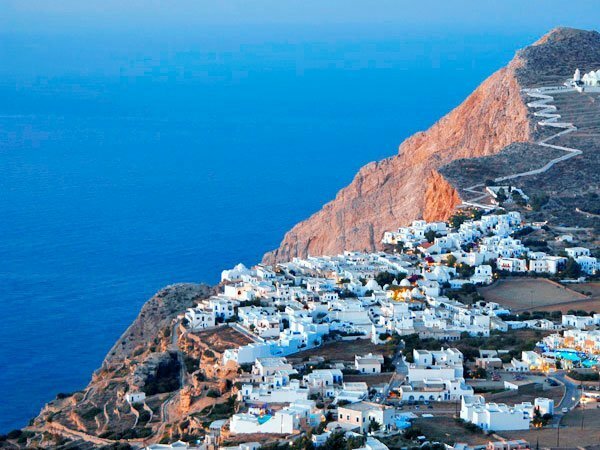 According to inscriptions, in the first Greek colonization (1000 BC), Folegandros was one of the few Cyclades colonized by Dorians who came from Santorini. 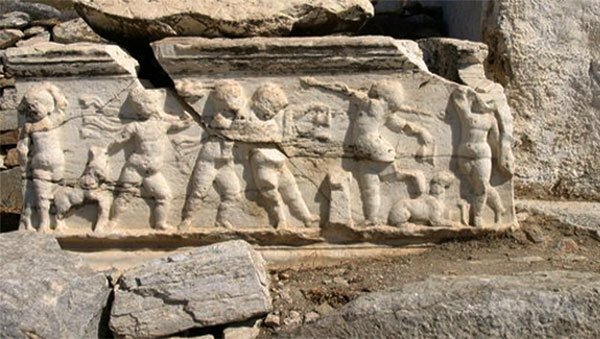 In 425 BC seems to have been tributary to Athens, while is referred to one inscription of the 4th-3rd century BC, found in Delphi. In Roman times it was a place of exile and in medieval times it belonged to the Venetian Duchy of Naxos. In 1566 the island was ravaged by pirates, in 1617 it was occupied by the Turks and in 1715 it was plundered and once again deserted. Center of life is Chora, near the east coast, one of the most beautiful Cycladic settlements, built at an altitude of 200 m on the edge of a steep cliff, around the Castle (Kastro), the initial Venetian fortified settlement, where the houses formed the outer wall. The image of the current district of Castle above the vertical steep rocky slope is one of the most wonderful Cycladic landscapes. Walking in the narrow paved alleys we see white houses with stairs and balconies, and the old churches of Eleoussa, Pantanassa and Agia Sophia. Picturesque and beautiful is also the newest settlement, with successive squares, where small churches stand out; the square of Kritikos (Cretan) with the church of Theoskepasti, the square of Kontarini with the church of Aghios Anthonios and the church of Aghia Aekaterini in the back side, the Piazza, oldest square, with the churches of Aghia Varvara and Aghios Spyridon and the square of Dounavi (Danube) with the cathedral of Aghios Nicholaos and the church of the Archangels. On summer evenings, the atmosphere is very charming in the squares with the restaurants and taverns, but also in the alleys with the bars. Many pass from Pounta square to enjoy the view to the steep side of the castle and the sea. Above Chora, a whitewashed alley towards the top of the hill leads to the white church of the Assumption of Panagia, built in the 19th century on the site of an older church. 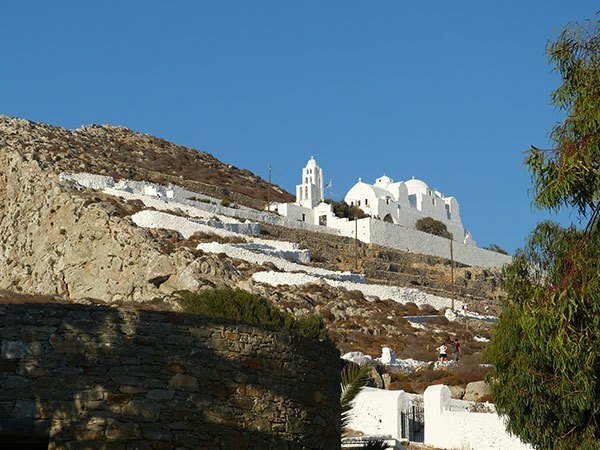 It is one of the most beautiful churches in Cyclades, aisle basilica with domes and an impressive tall bell tower, with the torso of a Roman statue in the wall. In the courtyard are architectural parts of an ancient temple. Many come in the afternoon to enjoy the view and the lovely sunset. 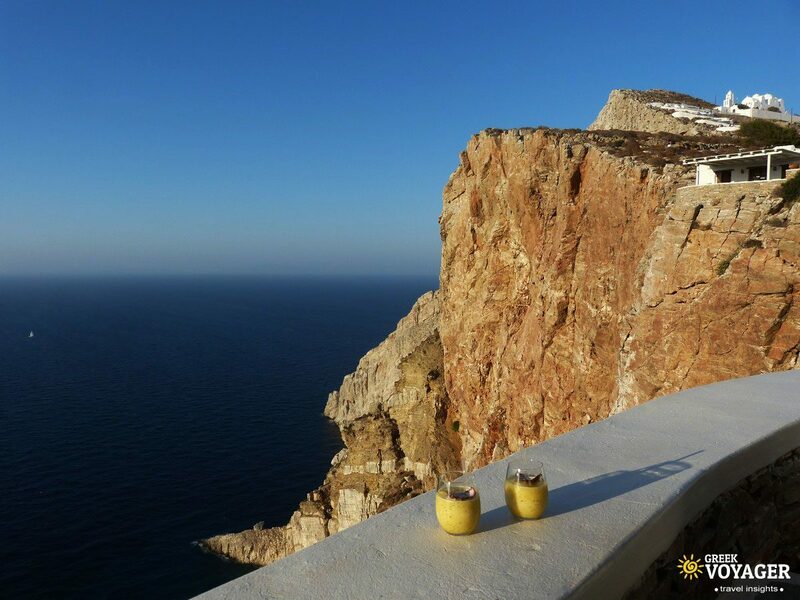 A path leads to the top, at Palaiokastro, where are traces of an ancient temple and the view is also wonderful. East of Chora is the Chryssospilia, a large cave on a steep coast, difficult to be approached, as the entrance is ten meters above sea level. But even to be approached by sea, a permission of the Port Authority is needed, because it is a unique archeological site. The cave was a place of worship and mainly a place for ceremonies of majority of adolescents in the 4th century BC, as evidenced by the names and the city of origin of the adolescents, engraved on the walls and ceiling. Fragments of vessels, human bones and a Roman cistern for water have been also discovered. The port of the island, Karavostasis, is 3 km southeast of Chora. It is a picturesque village with white houses, accommodation, fish taverns, a nice beach with shallow waters and nearby beaches. South from Karavostasis is Livadi, in a fertile valley, which years ago was cultivated for the first time by political exiles. On the east coast, a small resort with a nice beach and a camping site. At the south edge of the island is Katergo (Galley) beach, picturesque in a peculiar savage treeless landscape. The area was so named, because in older days an iron ore, the hematite, was mined here to paint houses and boats, and the working conditions were extremely harsh. We go either by small boat from Karavostasis or by taking a path from Livadi. 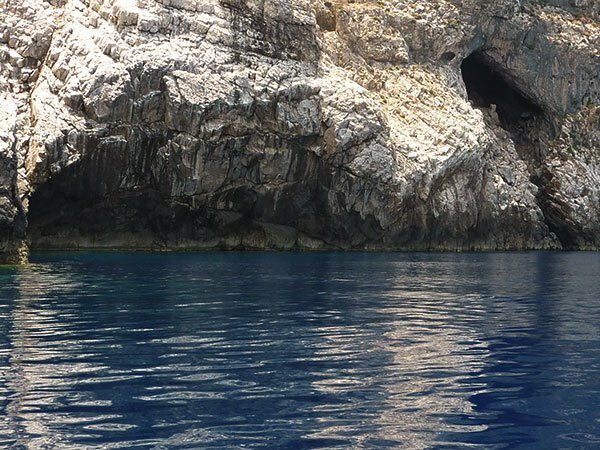 At the southern end is the cave of Georgitsis, where we also go by boat. 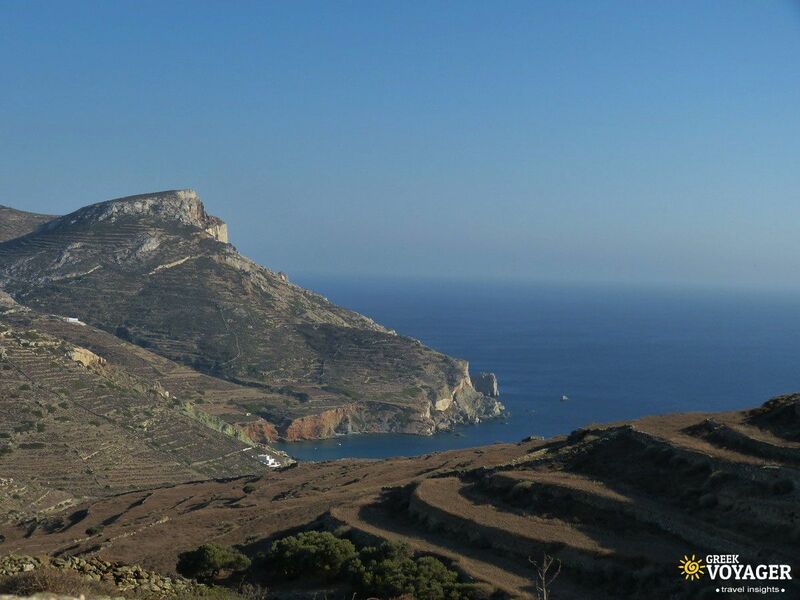 On the southern part at an altitude of 260 m is Ano Meria, the second settlement of the island, 5 km away from Chora. 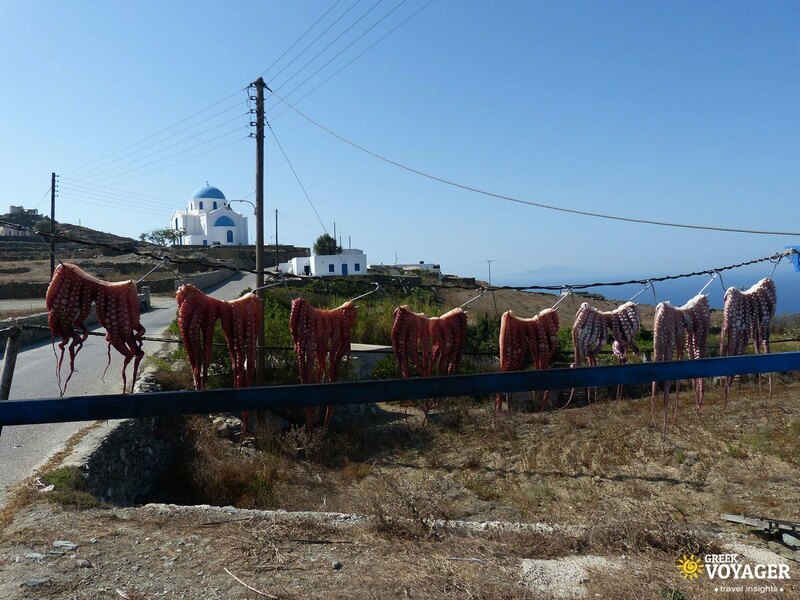 A typical example of the rural life in the small Cyclades islands. It has 300 residents, who live in scattered stone farmhouses, the “themonies”, as they are named these traditional rural units, which are autonomous with orchard and constructions for all agricultural and livestock activities. In the Folklore Museum of the settlement we can see such a traditional farmhouse of the 19th century with its furniture and the auxiliary rooms (cellar, oven, cistern, stables, threshing, olive press and wine press). In the village we can find taverns, traditional cafes, as well as a workshop of traditional “pasteli” (honey with sesame). The surrounding area offers many options to hikers. 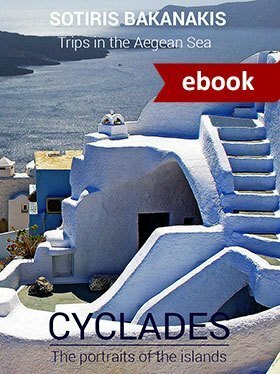 Trails lead to characteristic Cycladic landscapes with terraces, small churches and old windmills ending in small bays. One of the most beautiful hiking trails leads to the north coast, in the bay of Aghios Georgios with the church of St. George and a small beach. From there, a little further west at a short distance, is the beach of Lygaria. 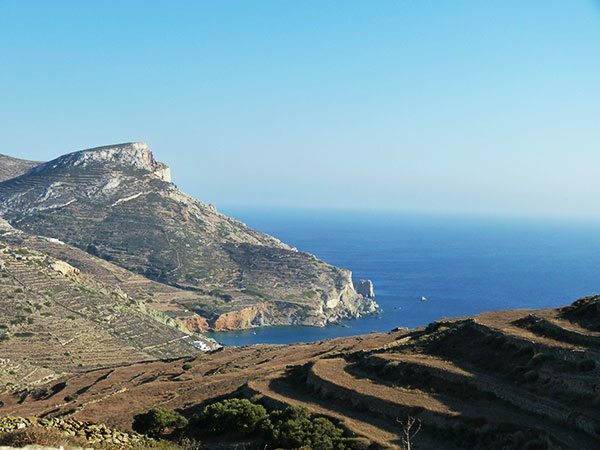 Other trails lead to the west coast, to the bays of Ambeli and Livadaki and the lighthouse of Aspropounta. Most beaches of the island are on the west coast. 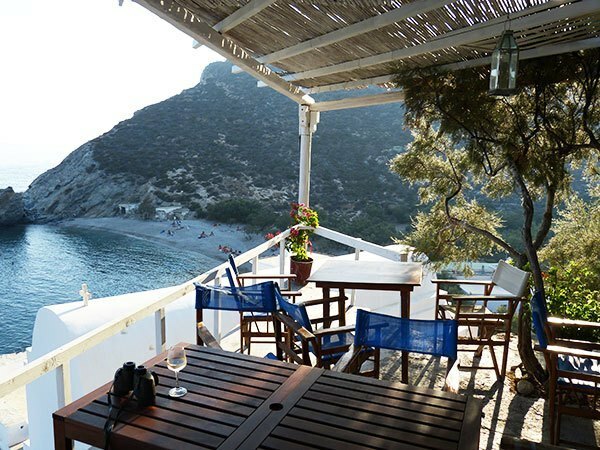 The most known is in Agali, a small resort without permanent residents, at 2.5 km northwest of Chora, in Vathy bay; a leeward beautiful sandy beach with shallow waters, trees and small taverns. On both sides are other small sandy beaches. The small port is a good refuge for yachts. From there we can take a small boat to visit the lonely beaches of the north. Walking south and after twenty minutes we reach Aghios Nickolaos, another nice beach with trees. 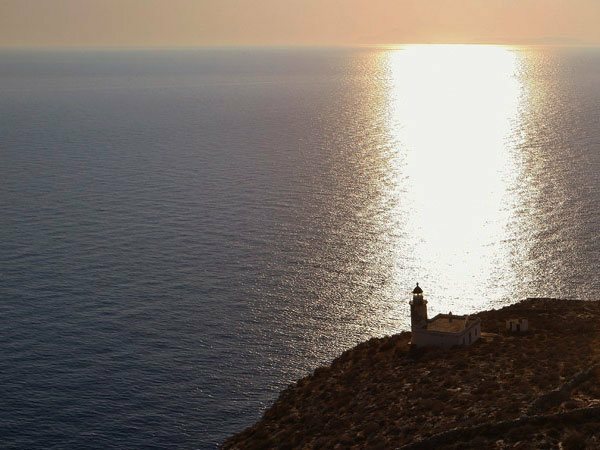 The Lighthouse of Aspropounta is located west of Agali and southwest of Ano Meria at the homonymous cape of the west coast. Built in 1919, the lighthouse is impressive because of the its elevation (about 60 m above the sea), and its lantern which is 11 m height. 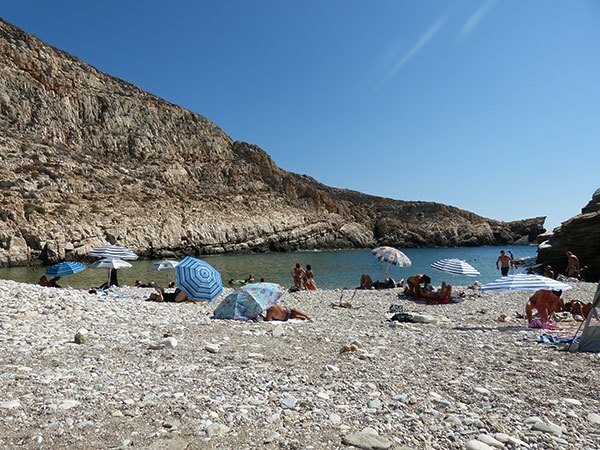 Nearby, further north, is the small bay of Livadaki with its beautiful beaches and small white pebbles. We can reach it by small boat from Agali and Karavostassis or on foot following the trails from Ano Meria. 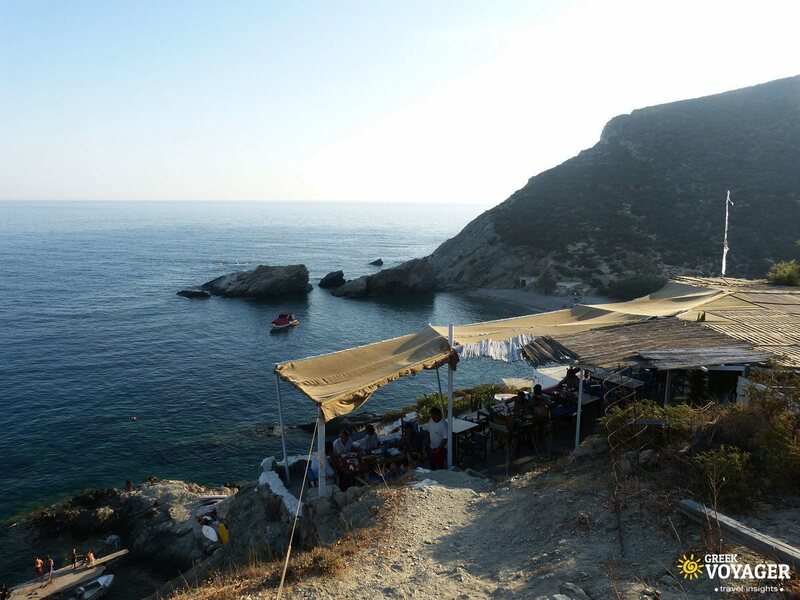 Further north is the nice cove of Ambeli with a solitary beach. East coast: (north) Serfiotiko, (south) Temeneos, Vardia, Karavostasis (Chochlidia), Latinaki, Vitsentzou, Pountaki, Livadi, Katergo. West coast: Ambeli, Livadaki, Dendro, Avlaki, Galifos, Agali, Fira, Aghios Nikolaos. Easter: the icon of Panagia for three days goes round the island – the first day in Chora, the second day in Ano Meria and the third day in Livadi and Karavostasis from where the caiques sail around the island. July 27: Aghios Penteleimon, Ano Meria. August 15: Panagia, Monastery of Panagia. August: sailing (regattas), Karavostasis, Agali. 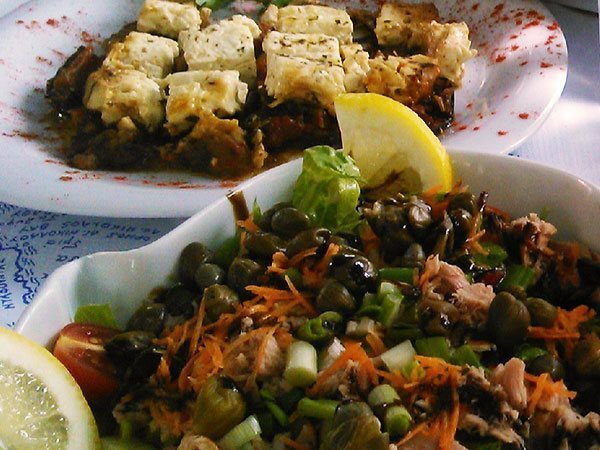 Goat meat (or rabbit or rooster) in tomato sauce or soutzoukakia with matsata (local pasta), tarachta (spaghetti with myzethra cheese), baked chickpeas, karavoli (snails), kalassouna (cheese pie), local pies (with zucchini, onions etc), sweet pie with watermelon, honey and sesame. Cheese (fresh and soft, hard spicy), wine, thyme honey.